Holidays are stressful. Don't get me wrong, I adore/obsess/swoon over Thanksgiving, Christmas, and New Years but I also become very stressed out. From buying presents, picking the perfect holiday outfit, finding the right charity, baking the yummiest treats, and having time to watch all the best holiday movies…it's overwhelming. This year, since bf and I are officially living together we are sort of a combo deal (even though we aren't engaged…YET;). That being said, everything from decorating to deciding who's parent's house to go to will be a decision made together. I was a little apprehensive about how exactly this was going to work. I am the decorator, baker, crafter, etc., whereas he keeps both of us in check and makes sure we spend equal amounts of time everywhere. We are already feeling the pressure this holiday season and trying to skate around it on ice is a wee bit challenging. There are definitely things we have learned so far and any advice from the veteran holiday do-ers would be helpful:). 1. Set up a game plan…one holiday at a time. With my parents being divorced we have three different holiday dinners to attend, 3! We decided that before making any rash decisions that the best idea was to start with the first holiday, Thanksgiving, and go from there. For us, this holiday was pretty easy because bf works Thanksgiving. That being said, I planned my day according to his schedule so when he was off work we could go to his parents house for dinner. It was much easier to discuss our schedules first before committing to all these dinners we wouldn't be able to attend. The biggest thing for me is that I didn't want to "take over" and go crazy with holiday decorations and have him feeling out of place in our apartment. We finally made a trip to Hobby Lobby and decided over a holiday theme and picked out ornaments together. I think it's important to involve your significant other because I have seen one too many relationships where the spouses are not involved whatsoever in each other's lives and it only ends up disastrous. Some relationships may not work this way but it has certainly helped us this season! 3. Decide on a budget, together! We were really excited about this holiday season because not only are we in the same state but we are living together! We both want to treat each other and buy one another tons of gifts and have a great time…but only under a certain budget. It was important to us that we didn't go overboard. We also decided that any large splurge (besides a gift) will be made together, as a couple. For example: we didn't have any Christmas decorations so we are essentially starting this holiday season off from scratch. Our biggest item to purchase is a Christmas tree and we both decided right away that we wanted a real tree. We have shopped around and agreed on a budget and that's that! 4. Take time for yourselves, together and apart! This is key to any successful holiday. Like I said before, the holidays can be crazy…you are constantly running around, party hopping, cooking, spending money, etc. It is important to take some time if you or your spouse is feeling overwhelmed. A simple bubble bath or watching a movie can help ease your stress and clear your mind. This point is simple. I have been so worried lately about having the right decorations, finding the perfect gifts, and baking the best pies that I am forgetting why I love the holidays in the first place. For me, it's a time to relish in one another's company and enjoy the spirit that the holidays bring…and that my friends, is priceless. Like I said before, any advice is always helpful. We are in unknown territory here people, it should make for a good month of blogging:). This is great advice, I think you will have a wonderful time. It's always a little difficult for me and my boyfriend; we live close to his family, but this year is uncertain because his grandmother is in hospital. My own parents are 200 miles away. So taking time to ourselves to unwind is essential. Great tips all around! 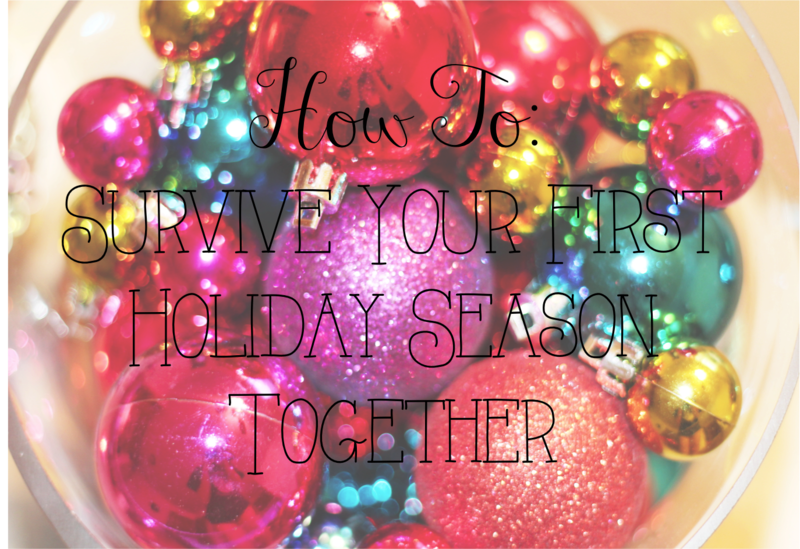 Communication is always key and try to remember the holidays are supposed to be fun. Keep the stresses and pressures low and you will be fine! "(even though we aren't engaged...YET)" OMG! I could barely read past that statement! I'm glad you two are getting along so well now that you are living together. I know I (along with the entire online world) will be kept updated on this YET statement!!! !